Many auto dealerships that use digital marketing vendor Cobalt to power their Web sites -- including General Motors' U.S. dealer network -- had their service disrupted today by a deluge in Web traffic. Cobalt is "addressing this issue with the highest priority," said Chris Reed, Cobalt vice president, in a statement. It was not immediately known how many dealership Web sites were affected, Reed said. Reed said Cobalt technicians noticed "an extraordinary volume of Web traffic from external networks" at about 9:30 a.m. EDT. In computer terminology, this is commonly known as a "denial of service" attack. As of 2 p.m. EDT, Reed said Cobalt's system was "getting back to normal and almost all sites are responding." The surge slowed some dealership Web sites across the country. The main Cobalt Web site also was affected. Cobalt is the primary Web vendor for General Motors dealers. In a statement, GM said, "An external network issue caused outages with General Motors dealer Web sites today. This issue resulted in slow response times. We quickly resolved the issue and continue to monitor so we can ensure the site provides the service levels our dealers and customers have come to expect." A GM spokesman said the company has about 4,400 dealers, and nearly all of their Web sites are powered by Cobalt. An employee of a GM dealer in the Philadelphia area who declined to be named said the outage is costing the store Web traffic and making its inventory listings unavailable except on third-party online shopping sites, such as AutoTrader.com and Cars.com. "We know 60 percent of people shop online," the employee said. 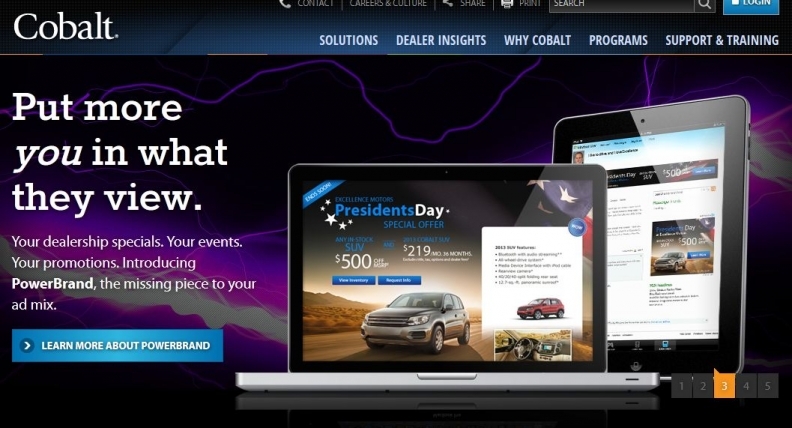 Cobalt is one of the largest providers of Web sites and digital marketing services to the auto industry. It is a unit of ADP Dealer Services.